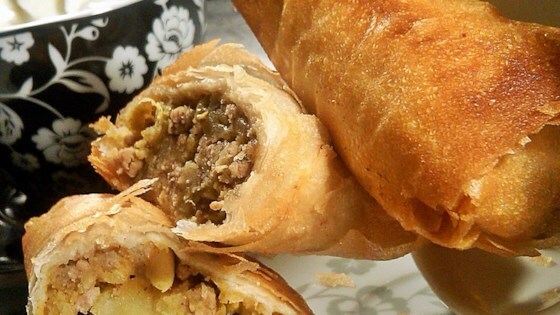 "Beef and potatoes are the main ingredients folded inside these wonderful deep fried samosas. Chicken livers may be substituted for beef, if you choose. My friend from Bangladesh gave me this savory, spicy recipe. You just can't buy better in the shops." In a large saucepan over medium high heat, heat the oil. Brown cumin seeds and bay leaf. Mix in onions and ground beef. Cook until beef is evenly brown and onions are soft, about 5 minutes. Mix in garlic, fresh ginger root. Season with black pepper, salt, cumin, coriander, turmeric, chili powder, cinnamon and cardamom. Stir in the mashed potato mixture. Remove from heat and chill in the refrigerator for 1 hour, or until cool. Mix cilantro and green chile peppers into the potato and beef mixture. Place approximately 1 tablespoon of the mixture onto each phyllo sheet. Fold sheets into triangles, pressing edges together with moistened fingers. In small batches, fry until golden brown, about 3 minutes. Drain on paper towels and serve warm. I tried making this, maybe it just wasn't our tastes but we didn't like it, it needs something else, but I dont know what. I used vegetarian ground beef and wonton wrappers (which were just the right size). They came out great.